One of the more interesting angles of the China financing story is the way it is hampering Venezuela’s ability to weather the current slump in the oil prices. The China loan deals Venezuela has embarked on the last few years are making a bad situation considerably worse. Here is why. Imagine, if you will a country that always sells a fixed amount of oil, no matter the price. You could say that country has a vertical supply curve – irrespective of what the price is, the quantities sold do not change much. Many industries exhibit vertical supply curves – for example, chances are that your local movie theater will offer the same amount of seats regardless of the price of movie tickets. 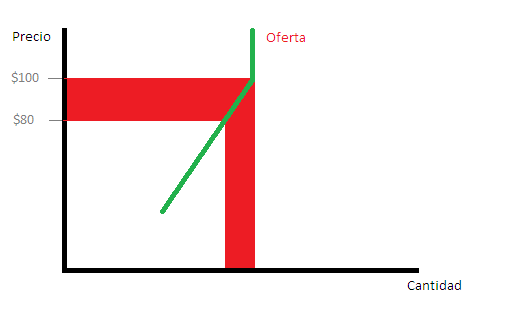 Since income is given by price (P) times quantity (q), we can say that for countries with vertical supply curves, a drop in the price of oil means lost income equal to the difference in price times the amount you sell. 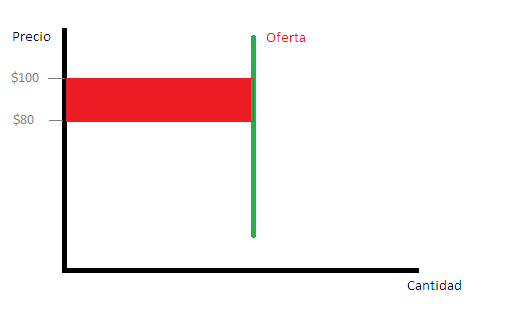 In this graph, the lost income would be given by the size of the read, very red area – the area of the rectangle is the price differential times the quantity. Venezuela, though, does not have a vertical supply curve. That is because the China loan agreements stipulate that when the price of oil falls, Venezuela must ship more oil to China to compensate, leaving fewer barrels available to sell to international markets. In other words, Venezuela has a positively sloped supply curve – a fall in prices is accompanied by a fall in the quantities available to markets. In other words, the graph for Venezuela doesn’t look like the one above, but rather like the one below. Notice how much larger the red, very red area is. The situation is quite simple. Because of the loans we signed with China – them paying in advance for future shipments in oil – the drop in oil prices means Venezuela doesn’t just sell each barrel for less money, it also has fewer barrels available to sell to the market. Venezuela’s downturn is therefore made all the worse by the ridiculous conditions the geniuses at PDVSA signed on to. In other words, a bad situation is made worse, and the hit in our fiscal income is all the larger. And why was all of this done? Why were the agreements with China signed in the first place? Next articleCould the Saudi strategy be working?